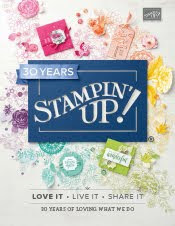 Just Julie B's Stampin' Space: Thanks A Ton! A quick post - with a quick card! Made this using the Sale-A-Bration set Patterned Occasions - Love this elephant! And I used the Vine Street Embossing folder for a little somethin' on the background. Oh, and I finally broke out my Floral Frames Framelits - I love how this one fits so nicely behind the 2-1/2" Circle!